Mustered out due to the Mustering out of his company. 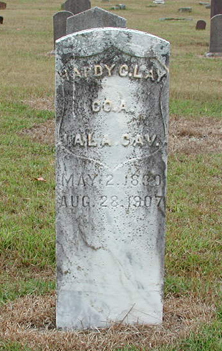 Hardy C. Lay was born May 2, 1830 in Hamilton Co., TN and died August 28, 1907 and is buried in Livingston Chapel Cemetery in Cullman Co., AL. He married Lucinda Pike June 16, 1862 and had the following children: William, born October 17, 1862, married Ophelia Barnett and died 1931; Lewis, born February 18, 1865, married Dora Barnett; Joseph Canady, born September 1866, married Nancy White; Monroe, born October 14, 1868; married Jane Stricklin; Martha Ann, born December 5, 1870, married Henry Striklin; Mary Jane, born 1869, married John Jacobs; Alexander, born February 1876; Jackson, born September 12, 1879. Livingston Chapel Cemetery in Cullman Co., AL.